As is the case with so many women in history, not much is known about our namesake. What we do know is a tantalising glimpse of a characterful woman who was a successful merchant and mother. Mary was born in Edinburgh at the end of the 16th century, and is recorded as marrying Thomas Nemo or Nimmo in 1616. Together they had four children; Alexander, Euphame, Jonet and William. Sadly Thomas died in 1629, and in his will he left Mary a title naming her a Burgess, this meant that she became a member of the city council and had voting rights. 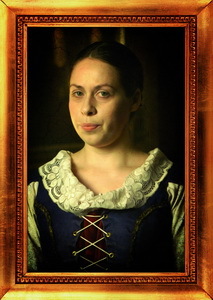 In 1635 she moved her family on to what was then known as Alexander King’s Close. Alexander King was a prominent lawyer in the city, and although he was no relation of Mary’s, the coincidence of the same surname is probably at least part of the reason for the closes name change. Closes in Edinburgh were named after the most prominent citizen or the most commonly found business to take place on the close. For example Fleshmarket Close was the city’s abattoir, Fishmarket Close was a fish and poultry market, and Anchor Close was named after a Tavern on the same street. Mary King rented a turnpike house with a cellar, near the top of King’s Close. A prominent businesswoman, she also had a shop on the High Street from which she traded in fabrics and sewed for a living. It was highly unusual for a close to be named after a woman at that time, indicating Mary’s standing in the town. As a woman on her own, with four children to care for, life would not have been easy for Mary King, however she seems to have lived a reasonably comfortable life. When Mary King died in 1644 she left a lasting legacy. In the years ahead, the close where she lived was named after her and in the course of time, Mary King’s Close became famous.